The first regional law enforcement effort in Arizona occurred in 1901 when the territorial governor organized the "Arizona Rangers". This small force made a strong impact on the rustling and smuggling problems of the time but was disbanded in 1909, three years before Arizona achieved statehood. Twenty-two years later, because of concern regarding the growing number of accidents and unlicensed vehicles on its highways, the Arizona Highway Patrol was instituted as a branch of the Arizona Highway Department. The initial force in 1931 was limited to a superintendent, 14 patrolmen (one authorized for each county) and one desk sergeant. In 1967, the governor's crime commission recommended creation of the department to "assemble state-level law enforcement activities into a single, effective governmental unit." Two years later, on July 1, 1969, the Arizona Department of Public Safety was officially established. It consolidated the functions and responsibilities of the Arizona Highway Patrol, the Enforcement Division of the Department of Liquor Licenses and Control, and the Narcotics Division of the Arizona Department of Law. Since 1969, the Department has been charged with additional responsibilities and has developed into a modern, comprehensive law enforcement agency. 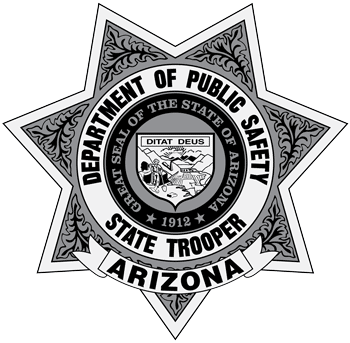 Today, the Arizona Department of Public Safety is a law enforcement agency with a primary focus of patrolling and enforcing laws on Arizona state highways. Additional responsibilities include enforcing laws in the areas of traffic, narcotics, organized crime/racketeering, liquor and specific regulatory functions. Operational and technical assistance is provided to local and state governmental agencies and other components of the criminal justice community; services include scientific analysis, aircraft support, emergency first care, criminal information systems and statewide communications. The Department also promotes and enhances the quality of public safety through cooperative enforcement, intelligence gathering, training employees of law enforcement agencies, and increasing public awareness of criminal activities. With its main headquarters in Phoenix, the DPS employs over 2,100 employees working together to serve and support the interests of public safety throughout Arizona. Arizona's reputation as the West's last refuge for hard-bitten desperados was a major reason its admittance to statehood was delayed so long. The proximity to the Mexican border, bad roads, poor communication, and rugged terrain made pursuit and capture of outlaws almost impossible. To make matters worse, rural residents were sometimes hesitant to assist peace officers because many of their neighbors were outlaws, and they didn't want to incur vengeance. The hard men who rode the Arizona Territory were products of a lawless, and violent post-Civil War era characterized by range wars, feuds. Apache fighting, and the lust for gold and silver. Today they and their deeds have slipped from reality into the realm of romance. Trail dust has settled and the false-front saloons are gone, but their stories linger on and are deeply ingrained in our culture. The types of men hired to keep the peace were as varied as the rest of the wide gamut of frontier society. Jeff Milton was the son of a Florida governor; Wyatt Earp was a restless entrepreneur whose skill with a six-shooter and nerves of steel made him a formidable adversary; Jim Roberts earned his reputation as a fearless gunfighter. Entire libraries may be stocked with the dime novels, paperbacks and western adventure stories involving Arizona outlaws and the men who devoted their lives to putting those outlaws behind bars or on the gallows. It seems certain that Arizona's lurid reputation as a haven for the lawless element delayed the achieving of statehood. During the Pleasant Valley War; Burt Mossman was a rawhide- tough ranch boss before he was appointed first captain of the Arizona Rangers; and Carl Hayden was a Stanford graduate with political hopes. All had one thing in common: they had little fear of God and none of the ole Devil. Milton is best known for his part in breaking up the Fairbank train robbery in February, 1900. Bravo Juan Yoas, Three-finger Jack Dunlap, and three cronies decided to rob the Wells Fargo express car while the train was stopped at Fairbank. However, the outlaws didn't figure on Jeff Milton riding shotgun in the express car. They opened fire as the train pulled in, and a bullet struck the lawman as he stood in the open door of the car. Bleeding from a wound in his arm, Milton opened up with a 10-gauge sawed-off scattergun. Three-finger took a full, fatal blast while Bravo Juan took evasive action and caught a load of buckshot in the seat of the pants. They didn't get the strongbox and were eventually captured. Milton survived and died with his boots off in Tucson in 1947. Earp made his reputation during the so-called "Gunfight at the OK Corral," or Cochise County War, in the early 1880s. Wyatt and his brothers Morgan and Virgil, along with their pal Doc Holliday, represented a law and order group known as the Citizens Safety Committee. They were organized to rid the county of a lawless element of politicos, along with some cattle rustlers known as "the cowboys." Earp's career as a lawman is controversial because the opposing faction had a large number of supporters who despised him and his organization. But one thing should be remembered: all the Earps were shot from behind, while their victims were plugged in front. That says a lot about who were the good guys and who were bad. Partisans on both sides of the Pleasant Valley War, pitting cattlemen against sheep men, agreed that the best man with a gun in that feud was Jim Roberts. He might never have taken sides, but some of the Grahams stole his Collection prize horse. He rode with the Tewksburys during the most violent days of the war before becoming a lawman in Yavapai County. Roberts had his last gunfight in 1928 in Clarkdale when two desperados held up a bank. They tried to make their getaway in a car, but Roberts stood his ground and put a bullet through the driver of the speeding auto. Old Jim was nearly seventy at the time. When the Arizona Rangers were reorganized in 1901, Burt Mossman agreed to a one-year enlistment as captain. Modeled after the famed Texas Rangers, Mossman's rugged men rode the Arizona Territory, breaking up the last of the large outlaw gangs. Captain Mossman's last hurrah as an Arizona Ranger was the daring capture of the notorious Augustine Chacon, a dark, handsome outlaw who boasted of killing fifteen Americans and thirty-seven Mexicans during his career. He'd been captured and sentenced to hang at Solomonville, but, just before the sentence was carried out, he escaped and hightailed it to Sonora. Mossman persuaded Burt Alvord and Billy Stiles, two ex-lawmen turned outlaws, to arrange a meeting with Chacon in exchange for leniency. Posing as a rustler on the lam, Mossman got close enough to the cagey Chacon to get the drop on him. He brought back his man, and this time the hanging took place on schedule. Knowing the Mexican government would be furious when the details of the capture below the border became known, Mossman resigned from the Rangers and headed east until the heat was off. In a desperate effort to bring law and order to Arizona Territory, the Arizona Rangers were formed in 1901 under Captain Burt Mossman. One of the prime targets of the Arizona outlaws was the stagecoach, which usually carried money or valuables and was an easy target. This one, a Modoc coach, ran from Tucson to Tombstone. One of southern Arizona's most respected Arizona Rangers was Bisbee's Johnnie Brooks. The theory flourished in Arizona Territory that public hangings helped to deter potential criminals from their foul deeds. This execution of a young murderer in 1889 was the first hanging in Globe. The crowd must have found the victim's anguished expression haunting their memories for decades to come. Finally, there's the tale of Maricopa County Sheriff Carl Hayden, best known for serving in the U. S. Congress longer than any other person in history (fifty-seven years). Few people remember Hayden's role in the capture of two train robbers in the desert south of Maricopa in 1910. It was at Maricopa that he borrowed a Stoddard-Dayton automobile from its owner, J. F. McCarthy, who was drafted into service as the chauffeur. The powerful car raced across the trackless desert and caught up with the Woodson brothers, known as the "beardless boy bandits," after their horses played out. Hayden ordered the robbers to surrender, but one refused to drop his pistol. So Hayden walked fearlessly toward the young man who, after a long moment, put up his hands. Only then did Hayden pocket his unloaded revolver. It's the first recorded incident of a posse pursuing outlaws in an automobile. Yep, the twentieth century had at last reached Arizona.